Ours years of experience in the national and international transportation of goods overland guarantee a quility and efficient service. Through continual advancements, we maintain hifh levels of client satisfaction by constantly upgrading our technology and the training of our team. GPS installed in alll of our vehicles. Help in 7 different languages. Our personnel organize and control the freight every step of the way from the initial order through to the delivery of the goods via direct contact with the drivers and satellite tracking systems. This is one of the many reasons that we are market leaders in the sector. 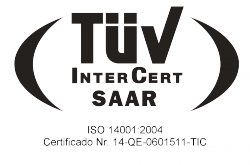 Our quality systems are certified by the norm UNE-EN ISO 9001:2008 by the Bureau Veritas, a prestigious certifier recognized on a national and international level.